Since 2002, Martin has performed over two thousand shows at events worldwide as a Professional London Party Magician, in over 50 countries, as a 5 year Resident Close-up Magician in Spain and on over 100 Cruise Ships! With masses of experience Martin has mastered the art of witty, comedy Close-up Magic bringing laughter and amazement to guests at weddings, parties & corporate events. 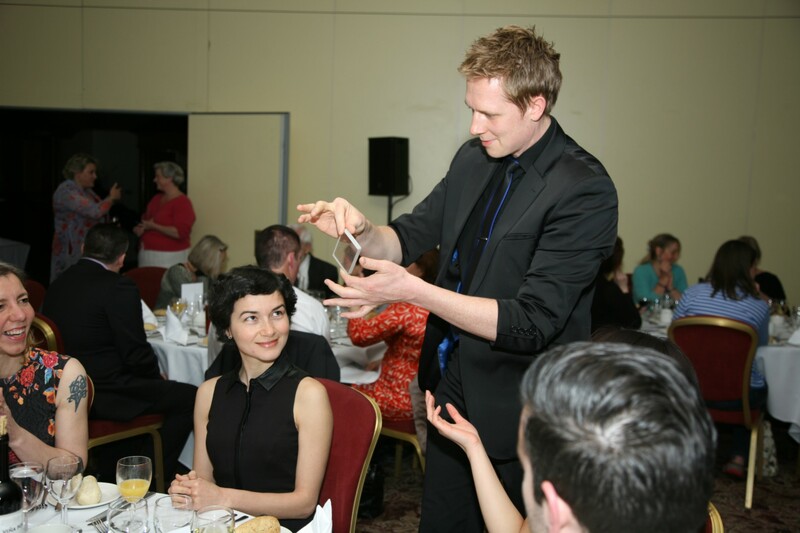 Now based in London, Martin travels to perform magic at events all over the UK & worldwide on request. Close-up Magic is perfect for any kind of party whether it be a celebrity party, birthday party, house parties, dinner parties & garden parties. Basically if there are people are in a group, at the bar or sitting at tables, Close-up Magic is the perfect ice-breaker! Martin will approach each group at your party and perform magic with cards, coins that fall upwards, ropes, sponge rabbits (a favourite for women & children) and even borrowed and everyday objects! Signed cards appear in Martin’s pockets, impossibly into his wallet and even magically change in the spectators hands. Depending on the amount of people at your party, Martin’s average time spent performing to each group is approximately five to seven minutes. This however is completely flexible. If you have a large party with hundreds of people, Martin can perform shorter but equally as effective routines. For smaller parties such as dinner parties, Martin can perform up to two different 10 minute routines to the same table, anything can be covered and Martin will ensure that he performs to your exact needs. On the other hand if the party has hundreds of people attending, Martin can either recommend another Professional Close-up Magician to work alongside him, or can also offer his Comedy Stage Magic Act which he has performed to audiences up to 4000! Alongside parties, Close-up Magic is the perfect ice-breaker for wedding cocktail receptions, corporate events, banquets, charity fundraisers, black tie events and many more. Any event or party where people are in a small group is perfect for Close-up Magic! At your party, Martin will either stroll around performing to groups of people or if your party guests are seated, Martin will also perform as a Table Magician. Martin will approach each table performing specially designed routines to be seen by all at any size table. How does this kind of magic work if the people at the tables are eating? Don’t worry…Martin performs table to table in between courses, creating a fantastic atmosphere at each table. Will he get in the way of the waiters?! As the 5 year resident at a dinner & dance show venue performing over two thousand shows, Martin has more than enough experience to work in any situation. If a waiter approaches the table ‘mid-routine’, Martin actually includes them in the routine! You can be assured of a comfortable, professional approach at every table. You’ve seen it on the television…now it’s time to have your mind read for real. Watch in disbelief as Martin guesses a colour that you are merely thinking of…over and over again! Still not convinced? Think of a time. A time that relates to a very important event in your life, perhaps the time that your child was born for example. How could Martin possibly have predicted this EXACT time? Book Martin for your party now and find out! Well…he probably won’t actually tell you how, but you will witness it first hand. At the age of 21, Martin flew to Spain attempting to make a living as a Close-up Magician performing his close-up act in bars for tips. After two months of performing seven nights per week he had been noticed by the management of the largest variety show venue in Spain, the prestigious 2000 seater Benidorm Palace. He then became the resident magician for five years performing close-up magic on spotlight, table to table in front of audiences of over 1000 nightly! Being presented with multi-lingual audiences, Martin learnt his show in Spanish & French. 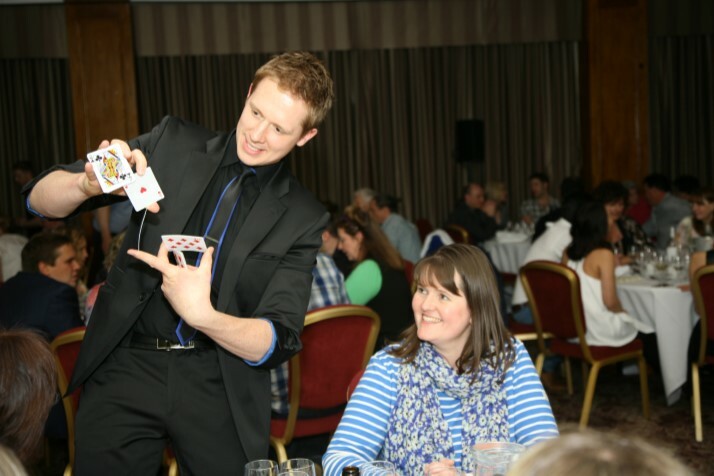 Over the five year period performing 5 nights per week, Martin gained a huge amount of experience as a Close-up Table Magician, performing over 1000 shows! Recognising his talent, the Benidorm Palace offered Martin a spot on the stage, which he accepted by developing and performing a double-act dove and parrot magic act, followed by flying to Las Vegas in 2006 to purchase a Lear Jet Aeroplane to make magically appear on the stage, now known as the World’s largest stage appearance! Gaining a large amount of experience in visual stage magic, Martin decided it was time to develop two full shows coupling visual magic with comedy, which proved a huge success. At the age of 25 he was approached by various cruise lines, where he baffled and brought laughter to audiences perfoming his Close-up & Comedy Stage Magic shows for a further 5 years! Just wanted to say thank you Martin for performing your amazing tricks at our house party, it was exactly what we wanted and everyone is still talking about it! I just wanted to thank you for performing at my party last night. Everyone loved your performance it was perfect! Everyone loved your performance it was perfect!